DX5 is the latest addition to the Dispersion Series of multipurpose monitor speakers from French manufacturer APG. Grund Audio Design announces the availability of the GT 01 Series loudspeakers. 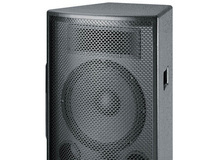 Peavey announces the availability of its PVX 12 and PVX 15 passive loudspeakers. L-Acoustics introduces the 5XT ucoaxial enclosure and SB15m subwoofer. HK Audio has released a new series of speaker cabinets called Linear 5. Several new Nexo products are debuting this week at this year’s ProLight+Sound / Musikmesse in Frankfurt, Germany. JBL Professional introduced its PRX400 Series of passive portable loudspeakers.